Lock in a great price for Arraigos – rated 8.6 by recent guests! One of our best sellers in Melide! 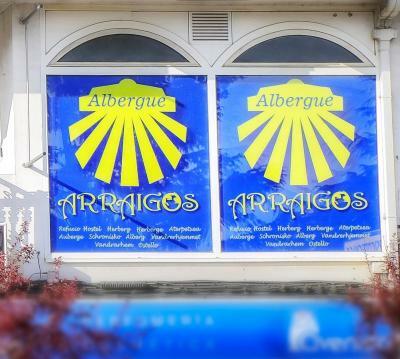 Located in Melide, Arraigos provides a shared lounge and free WiFi. A tour desk can provide information on the area. All guest rooms in the hostel are equipped with a flat-screen TV. The rooms include a shared bathroom. The rooms at Arraigos are equipped with a seating area. Portomarin is 28 miles from the accommodation. The nearest airport is Santiago de Compostela Airport, 27 miles from Arraigos. This property also has one of the top-rated locations in Melide! Guests are happier about it compared to other properties in the area. When would you like to stay at Arraigos? House Rules Arraigos takes special requests – add in the next step! Arraigos accepts these cards and reserves the right to temporarily hold an amount prior to arrival.